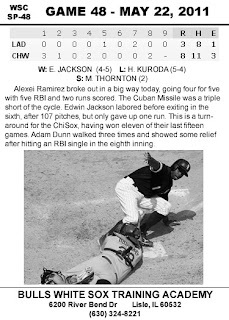 Donruss' second baseball set certainly improved upon the original. 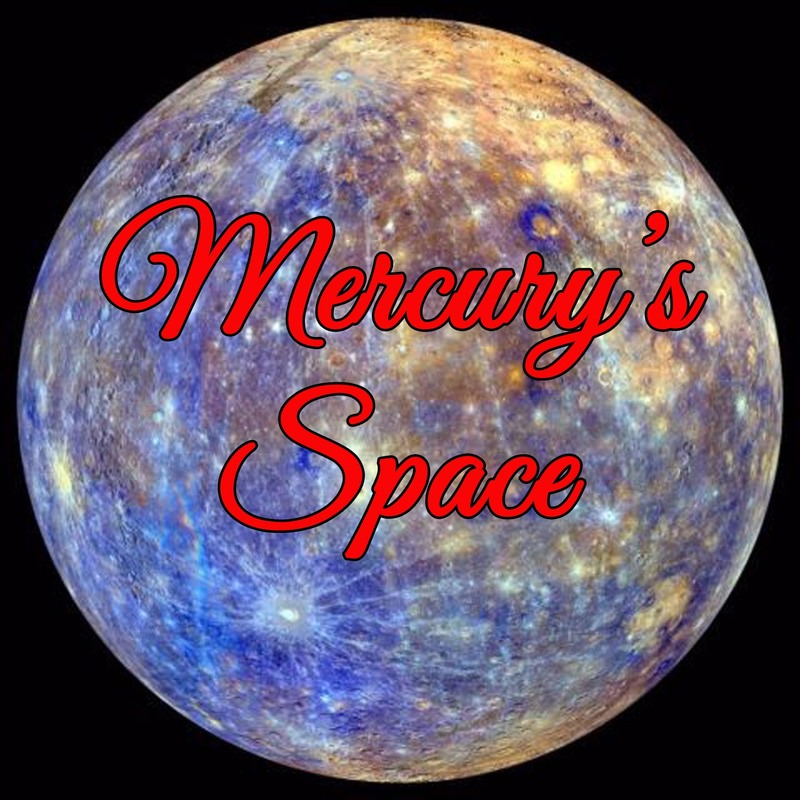 There were less errors, somewhat better photography and a slightly upgraded design. That is to say that the photographs were still average to poor quality and the design had elements that were fresher but had the unfortunate luck of looking childlike. The card stock was an improvement on the paper thin 1981 release. It lacked the newness of the previous year, but held its own upon initial release. 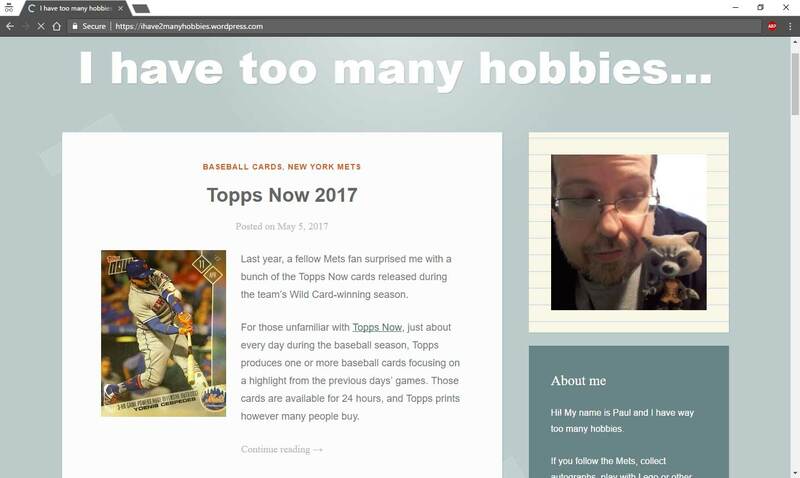 In hindsight, this year did nothing to topple the Topps monopoly. 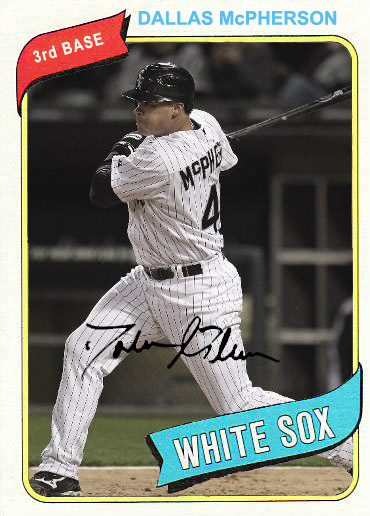 Topps had the better execution with design. Donruss was well ahead of Fleer in design and flash. 1982 Donruss looked like a second tier baseball card. That's exactly where they were at this point. Big things were on the horizon, but this was a nice stepping stone. This was the first year for Diamond Kings and this would help elevate Donruss from second rate to second tier. Diamond Kings are still popular today and this is where it all started. 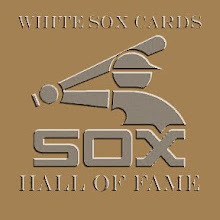 The choice for the White Sox initial Diamond King offering was Carlton Fisk. It was the perfect choice. Fisk's 1982 Diamond King cards is one of the most fondly remembered. The White Sox have twenty-seven cards in this set. Donruss corrected their oversight from the 1981 set and included a Harold Baines card. What makes this set unique is the inclusion of a few coach cards. The White Sox have one coach card in this set; Vada Pinson. This is a nice set that often gets overlooked. It wouldn't reach the heights of the 1984 set, but it certainly wouldn't reach the doldrums of later years. This was a set made before Donruss got parallel happy and one can see the inspiration of greatness yet to come for Donruss in this set. 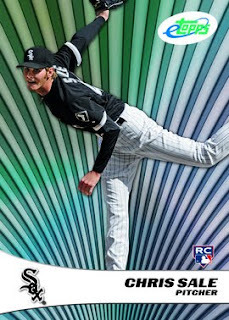 Chris Sale gets to pitch in front of this "really interesting" design. As strange as it was to see long time Red Sox third baseman, Wade Boggs, on the Yankees, it was even stranger to see him on the Devil Rays. What was even more amazing was that Wade Boggs could still hit at age 41. Wade collected his 3,000th hit in 1999, and finished his career with 3,010 hits. In his final year, he still hit over .300. In fact, the lowest average Wade had ever had for a season came in 1998, and that was still a respectable .280. As a kid, I respected the hell out of Wade Boggs. 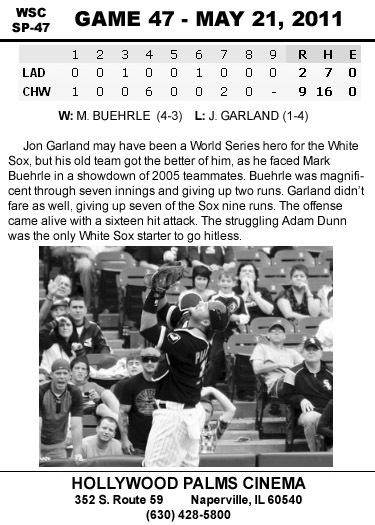 I admired his high batting averages and wished that the White Sox could land him someday. 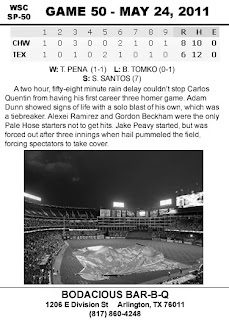 Instead, I was stuck with a rotation of third basemen that included such household names as Tim Hulett, Wayne Tolleson, Steve Lyons, Carlos Martinez and Kenny Williams, among others. 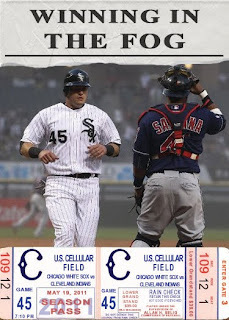 I always thought that Boggs could put the White Sox over the top and into the playoffs. Of course, this was before I knew the intricacies of trades and free agency. 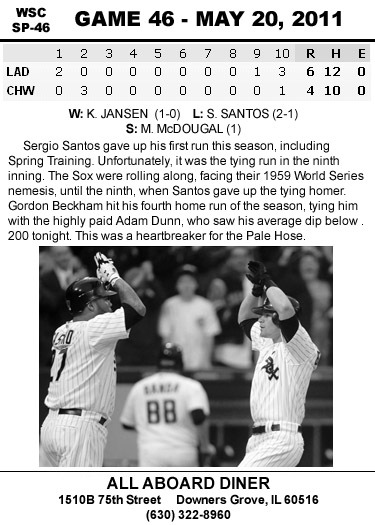 If the White Sox did ever trade for Wade Boggs in the eighties, I probably would have missed out on seeing Jack McDowell, Robin Ventura, Frank Thomas and Alex Fernandez in a White Sox uniform. 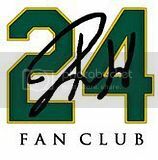 I was a kid and had no clue what four great years in the draft could do to revitalize my favorite team. 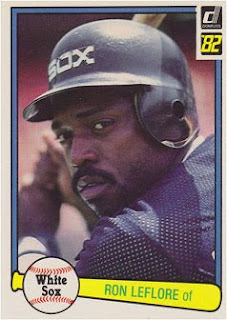 Still, I would have loved to see Boggs hit in Comiskey Park on a regular basis, alongside Baines and Fisk. I have a soft spot for newer teams. I'm always intrigued with additions to the MLB cache of teams or a city move. Back in 1993, I owned Marlins and Rockies shirts and would wear them often. I thought the idea of a team in a brand new place was great. I especially liked seeing more players get a chance to be on a major league roster. I thought it might introduce an influx of new cards. When the leagues expanded again in 1998, I was curious. I absolutely adored the hideous Devil Rays uniforms with the interesting color scheme. 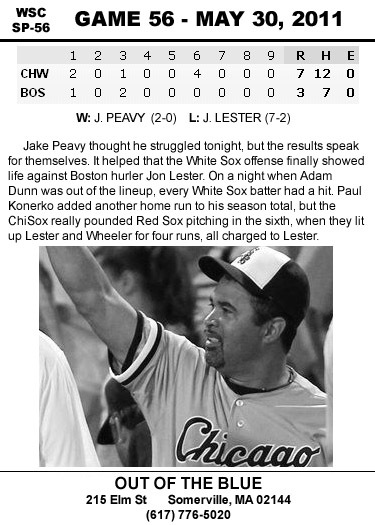 It was even better that I saw an instantly recognizable face in that hideous uniform with Wade Boggs. The combination of every factor is included in this card. 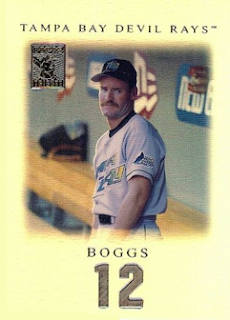 Wade Boggs in a pose where one can truly appreciate that great mustache, the Devil Rays uniform with the rainbow lettering, and an eye catching card. There is a look of bewilderment on Boggs' face, as if he's wondering what he's doing there. My guess is that after hitting the first home run in Devil Ray history, he's waiting to become the first player in MLB history to hit a home run as his 3,000th hit. A great card plus a great player plus a hideously great uniform equals my favorite Tampa Bay Devil Rays card. 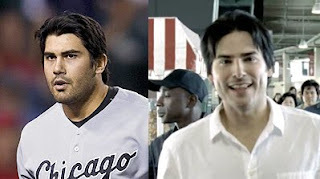 The first time I saw the State Farm commercials inside Angel Stadium, myself and countless others pondered the question, "How did State Farm get Carlos Quentin to do commercials and how did they get him to smile?" Well it turns out the mysterious TCQ doppelganger is none other than soap opera actor Eddie Matos. I still have to do a double take when the commercials featuring Eddie Matos come on. 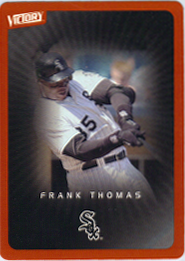 Frank Thomas' first 448 home runs were hit in a White Sox uniform. 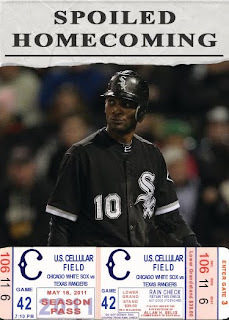 Paul Konerko has to hit eighty more home runs with the Sox to match that mark. For now, Frank Thomas sits atop that monstrous team achievement. 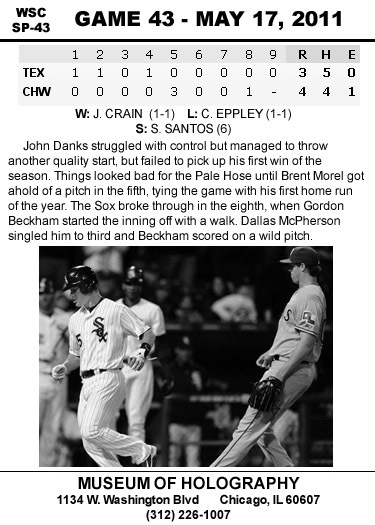 Through parts of sixteen seasons on the South Side, Frank also sits perched atop other team records. Konerko may eventually surpass some of them, but not for a couple more years. Paulie has to get 301 more RBI to tie Frank. Thomas' 1327 runs scored will probably stand for quite awhile. 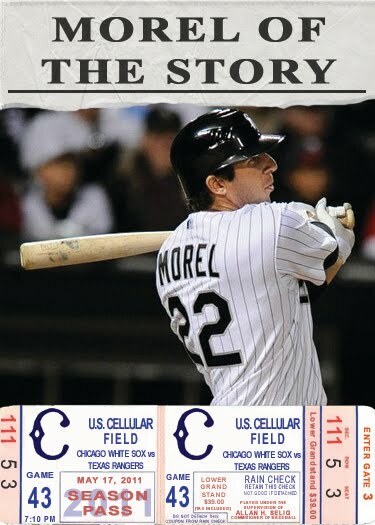 Konerko is the only active Sox player close to that team mark, but he has to climb over Eddie Collins, Nellie Fox and Luke Appling to even sniff Frank's record. Frank also leads the team in doubles with 447. 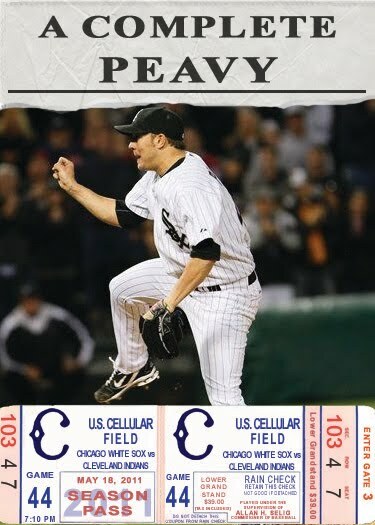 Konerko needs 107 to tie Thomas, but has to leapfrog over Luke Appling (440) to get really close to the mark. 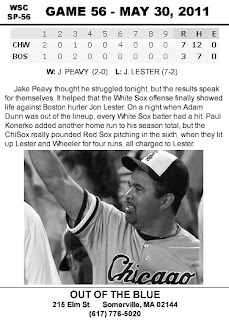 If Paulie were to ever eclipse Frank in home runs and doubles, then he would also overtake him at extra base hits. 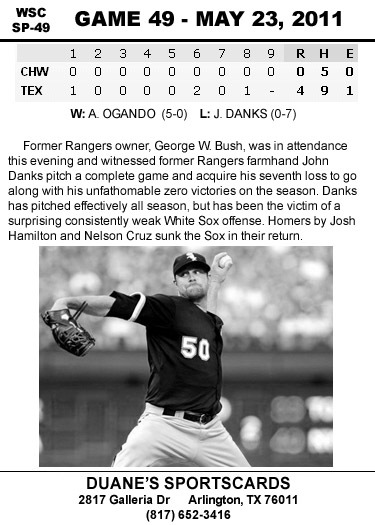 Frank has 906 and Konerko currently has 716. It's not impossible to think that this record may topple to Konerko, but we shall see in the next few years. I doubt Frank's intentional walk team record will ever be broken. It stands at 162. 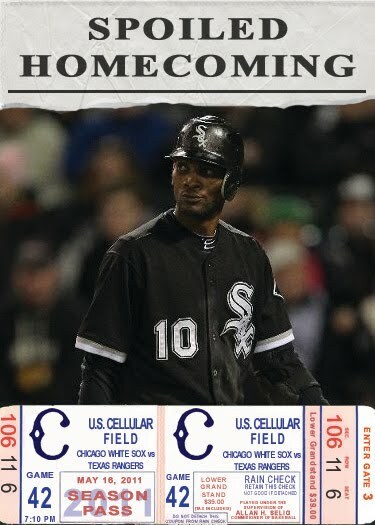 Harold Baines only has 107 and the closest active player, Konerko, has 58. Frank's team record for walks will have a hard time crumbling. 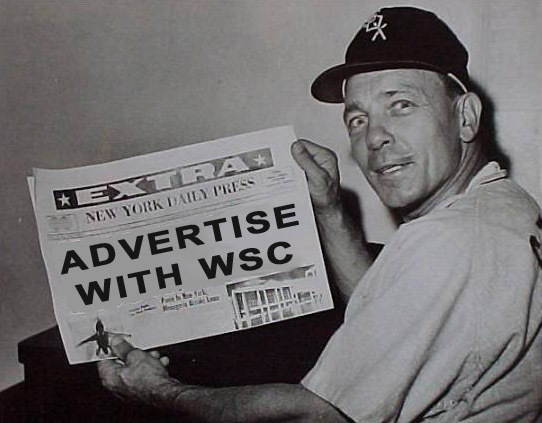 Frank has a staggering 1,466 walks with the White Sox. That eclipses Luke Appling by 164! The closest active player is, yet again, Konerko with 738. Paulie would have to play full time until at least 2023 to have a shot at the team walk record. 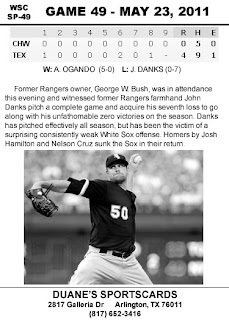 That would mean that if Konerko kept up his present pace of walks, he would have the team record sometime after his 47th birthday. I don't see that happening. Looking over the numbers, I am reminded at just how good of a player Frank was. He was scary in his prime and still commanded respect at the tail end of his career in Oakland and Toronto. His White Sox on base percentage is monstrous at .427! 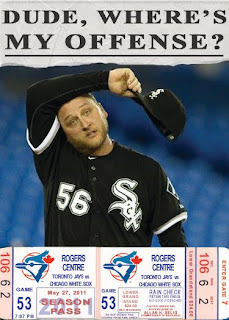 His slugging percentage is also team best at .568! 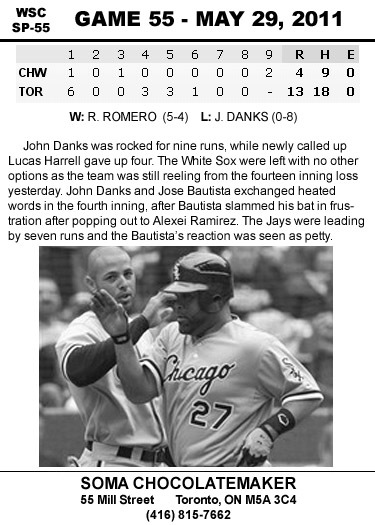 I've had the privilege to witness Frank Thomas from his first game in 1990 to the end of his career. 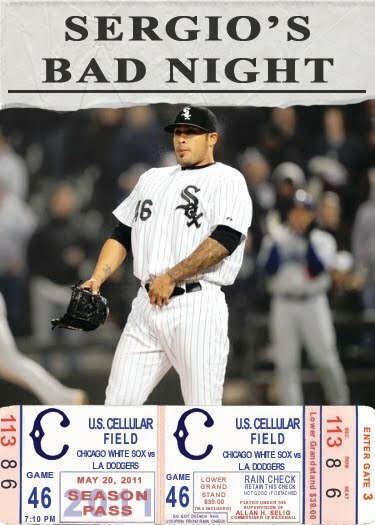 I guess what I'm trying to say is thank you, Frank, for staying as long as you did and giving the fans thrill after thrill. Oh yeah, and enjoy your birthday today. 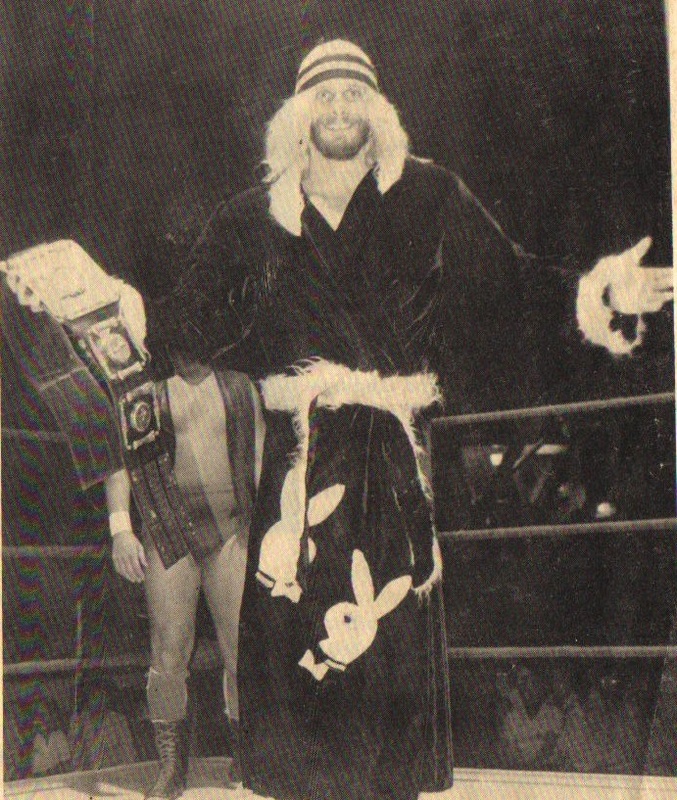 There has been much interest in Randy Poffo's minor league career. Card sets are sketchy from the seventies regarding the minors. 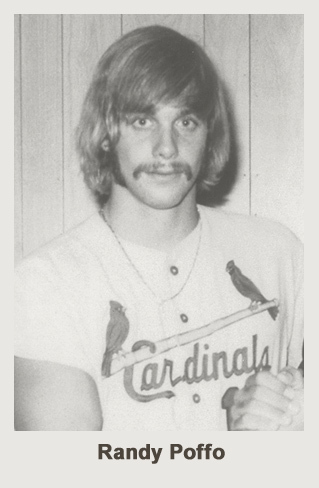 Randy spent the majority of his baseball career with the Cardinals organization. I was able to find a Cedar Rapids Cardinals minor league set from 1972, which I have based Randy's card off of. 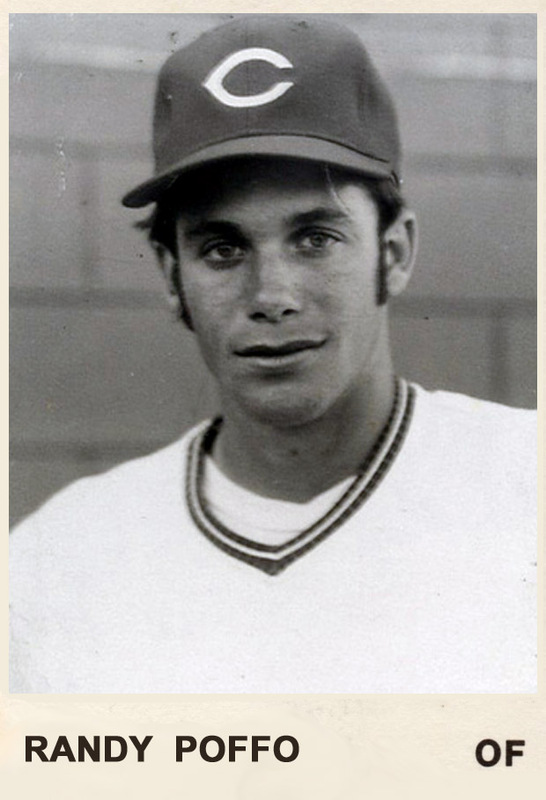 Poffo spent three years in the Cardinal minor league organization, from 1971 to 1973. I chose the 1972 card partly because the cards are available, therefore a record of design exists, and partly because this year puts Randy smack dab in the middle of his Cardinals stint. The original set only had a player name and a black and white bust shot of the player, so these elements were mimicked for this card. Minor League sets in the seventies are very poorly documented, so there may be a Randy Poffo card out there, but somehow, I doubt it. Before Randy made wrestling his full time profession, he tried his hand at baseball. Much has already been written about the organizations he was with and how an arm injury derails his Major League dreams. 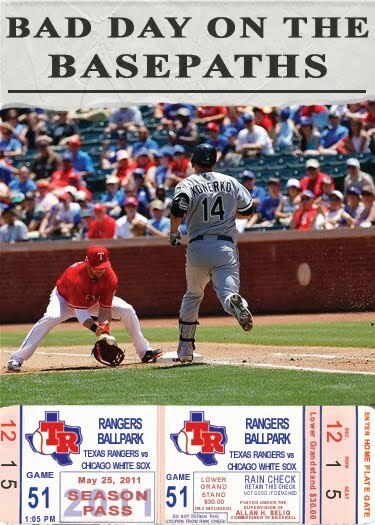 There has even been tales of how Randy loved baseball so much, that he taught himself how to use his other hand, in an attempt to keep his diamond dreams afloat. This led him to a Spring Training invite with the Chicago White Sox in 1975. 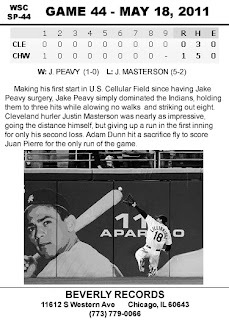 Before all that, he was in the Cincinnati Reds organization for the 1974 season. He mostly played the outfield during his time there, but found himself at first base and catcher as well. 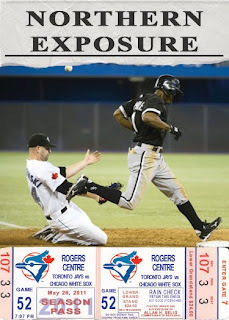 I have been searching for many years for photos of Randy from his baseball days. Since his passing, a few have leaked out. All of them have been in black and white. No pictures have surfaced yet of Randy in a White Sox uniform though. 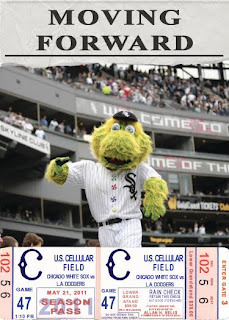 I'd like to make up for his lack of a baseball card by making one using the 1974 TCMA Minors design. As luck would have it, that set used black and white photos. 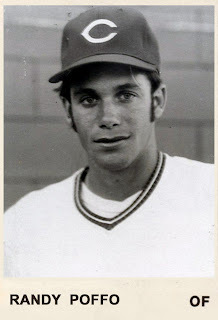 One day, I'd like to make a White Sox card of him, but I am pleased to have any photo of Randy Poffo in a baseball uniform. 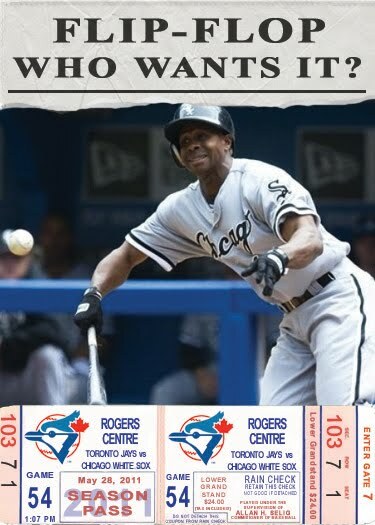 Juan Pierre and a few of his older friends; Chet Lemon, Harold Baines, Carlton Fisk, Tony LaRussa, Steve Lyons, Ozzie Guillen, Bo Jackson, George Bell, Tim Raines and Frank Thomas. This is all thanks to Brian of 30-Year Old Cardboard fame. 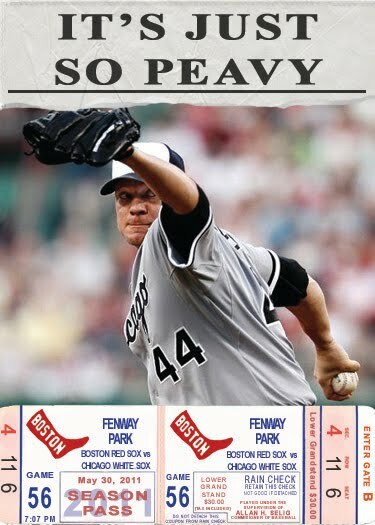 I received a surprise package in the mail, addressed to "my favorite Sox fan". Inside there were goodies dating back to 1981. I can already spot a few upgrades for my collection in the early eighties stuff. The 2011 Gypsy Queen Pierre was just the icing on a great package. Thanks, Brian! This was a great surprise and is something to brighten up the day, as I wait for the White Sox to come back from a hail and rain delay and lament my local NBA team for wasting a ton of shots during overtime against the collusion dream team. As we headed our way north on 294/94, we passed many familiar sights. By the time we were passing Six Flags and Gurnee Mills, we were almost in Wisconsin. My fiancee and I were a little rushed, only because she had worked earlier in the day. We passed under the bridge and were welcomed to Wisconsin, thus entering a less familiar area, ruled by single lettered county roads. 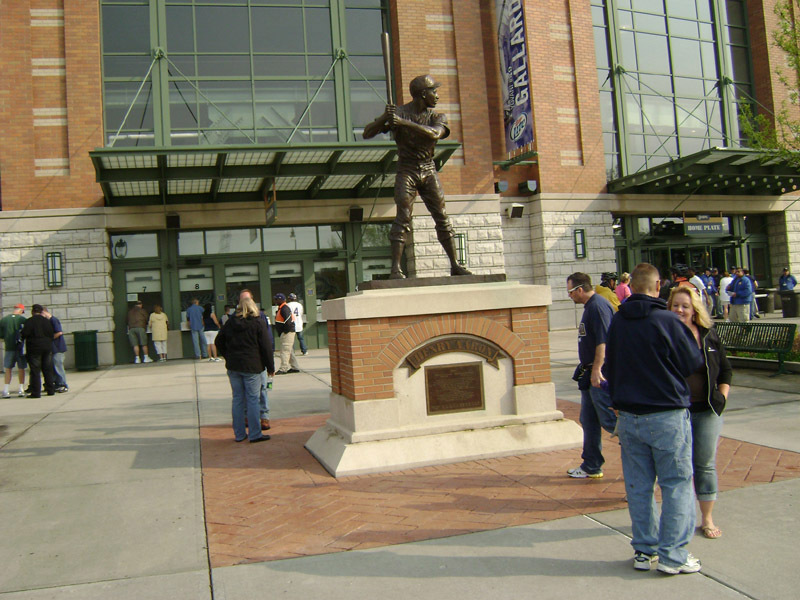 Getting to Miller Park was easier than we even imagined. Follow the 94 signs and don't end up in Madison. 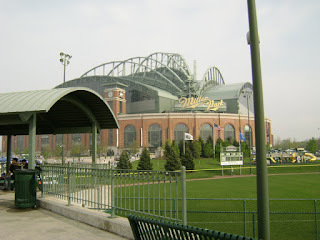 I have been to a lot of places in Wisconsin, but never Milwaukee. It was long overdue. I saw the sign that read "South Milwaukee". Then, I was hit by a stench that could only be described as raw sewage mixed with stale beer farts. 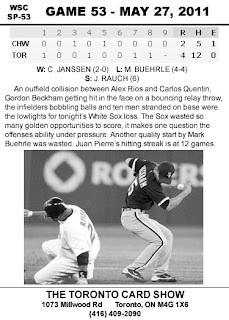 It was unpleasant, but not enough to ruin our day. Exit 308A led right into the parking lot, which was convenient. Everyone was friendly and courteous. Once parked, it was just a short walk across the parking lot and we were greeted by Hank Aaron's statue. My immediate thought was that Aaron only played two years with the Brewers, but I quickly remembered that he spent the majority of his career with the Braves, who were in Milwaukee for a huge chunk of Hank's career. It made sense now. It wasn't the greatest game that I've ever attended. There were many booted balls and a few errors, but both teams were scrappy and the home team won. 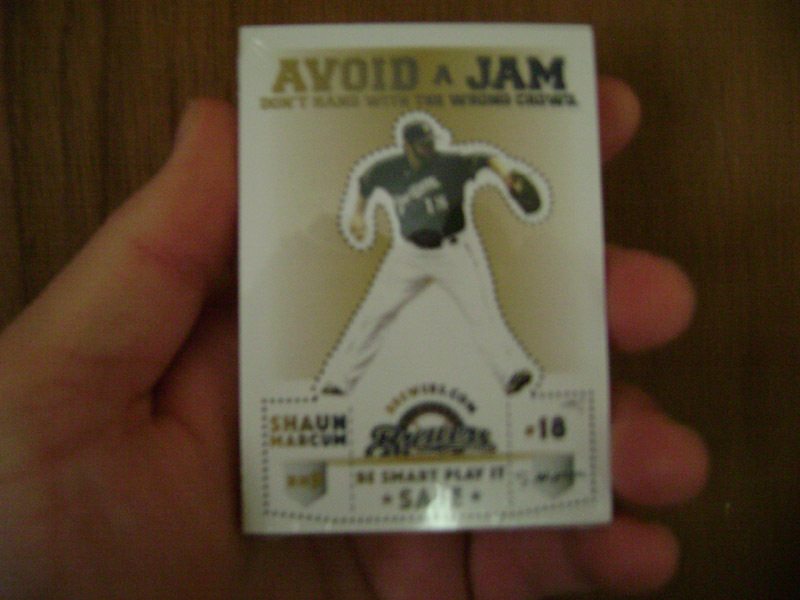 I was a bit surprised to see Ryan Braun's face all over everything. I expected Prince Fielder to be a bigger presence inside the park. I was surprised to see a Harley ride around the warning track and even more surprised to see a Chevy Cruze driving that same warning track multiple times between innings. The line of Harleys along the back wall was pretty cool and definitely unique to the park. 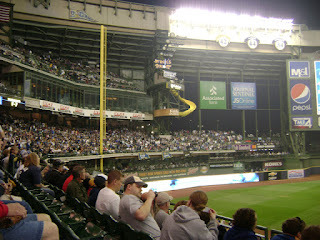 I was a little disappointed that Bernie the Brewer didn't slide down the big yellow slide when Lucroy hit his homer. Is the "Where's Bernie?" banner part of some contest? Is that why he wasn't there? The folks were friendly enough. I only had one comment on my White Sox shirt. 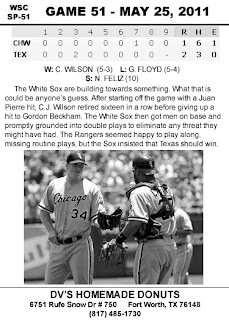 I heard "White Sox. What?" from some man that I passed on the second level, before the game. It made me chuckle. 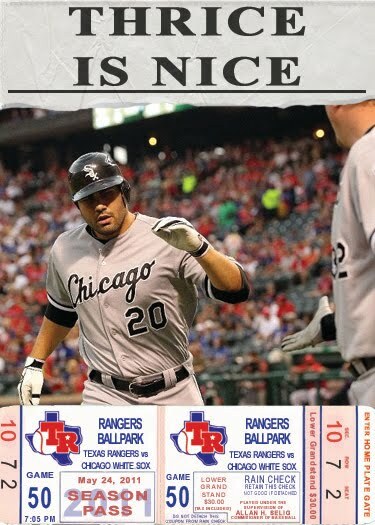 I spotted some man in a White Sox black jersey at the pitching area on the second level. 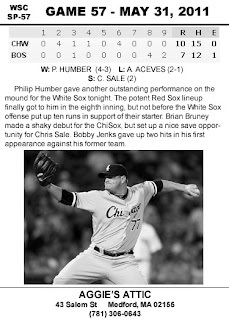 It was comforting that someone else was in White Sox apparel. My fiancee chickened out and wore a Brewers shirt. 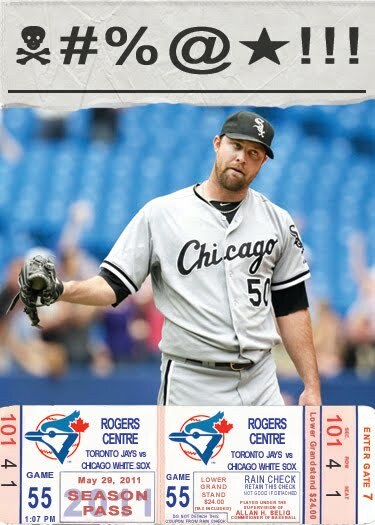 I would have picked one up too, but the ones with the retro ball and glove logo (which I'm a big fan of) were too small. The sewage/beer fart smell only popped up occasionally once inside the park. I'm still unsure as to the origin of that, but it really wasn't much concern throughout the night, just odd. 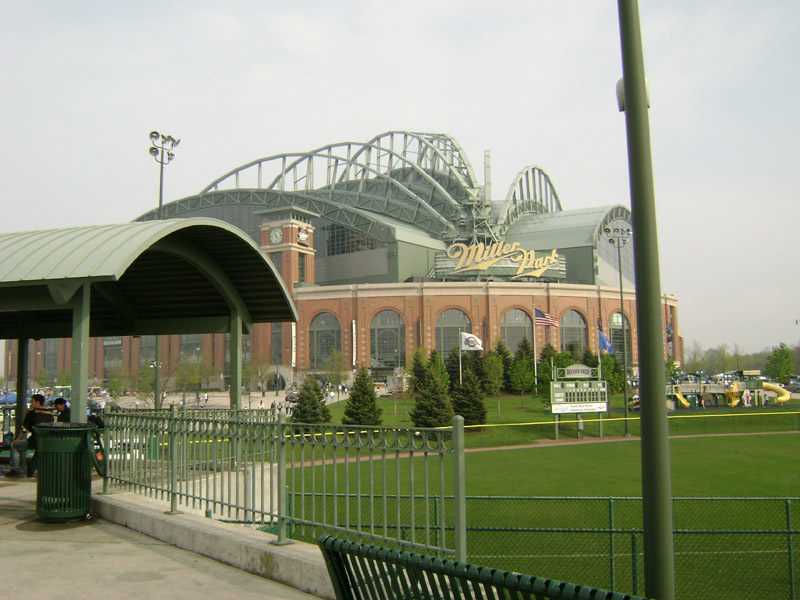 We walked around Miller Park and surveyed the food stands. Beer, alcohol, beer, brats, cheese, hot cheese, pizza, beer, hard alcohol, burritos? !, nachos with cheese, beer. Tracey picked up a cheese pizza and an order of cheese curds. I tried a pepperoni pizza and the only thing I saw without cheese, a Chicago dog. I have to say that Miller Park featured the best Chicago hot dog that I've ever had outside of Illinois. All the ingredients were fresh and correct, including the celery salt and kelly green relish. The presentation was appealing enough that I regret not taking a picture of it. I've never seen a Chicago dog with sliced and fanned onions and a vertically sliced pickle, but it tasted great. The park wasn't crowded, but it was lively. The crowd did get into the game, despite what I've heard elsewhere. 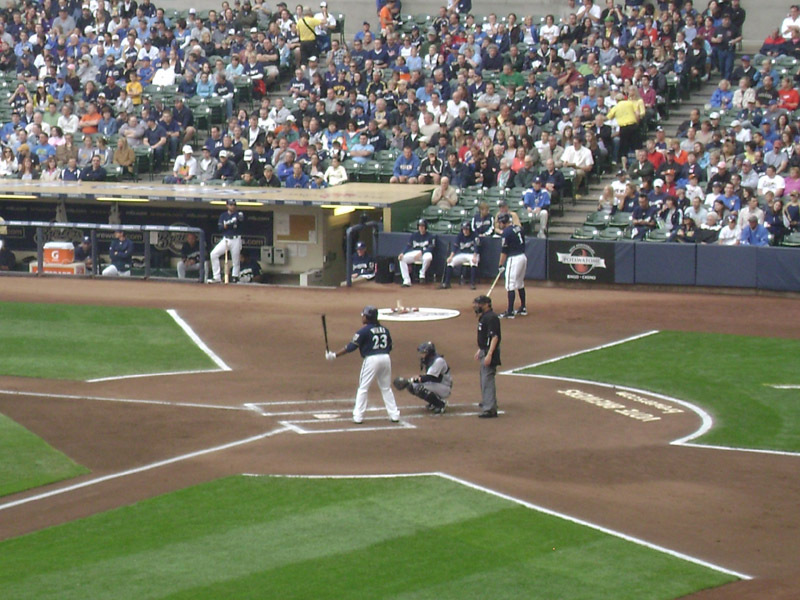 Many patrons dedicated a little more time to their alcohol than to the game, but the Brewers were almost as important to all. With any major sporting event, I know I'm going to hear, "Ice cold beer", at great volume out of the vendors mouths. I will physically hurt the next person who responds with, "It's better than warm beer". I heard that retort over three dozen times in the span of seven innings. I never need to hear that answer again. 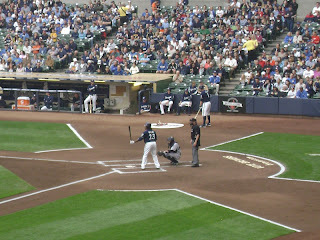 I had a blast visiting Miller Park! I would definitely go again. The weather cleared up and the roof was opened right before the starting time, which made the game conditions perfect. An unexpected bonus for the day: the giveaway was baseball cards! Thanks for being so hospitable to a couple of visiting Chicagoans, Milwaukee! The world may be ending tomorrow, according to some loons, but I will not go before I see Mark Kotsay again. 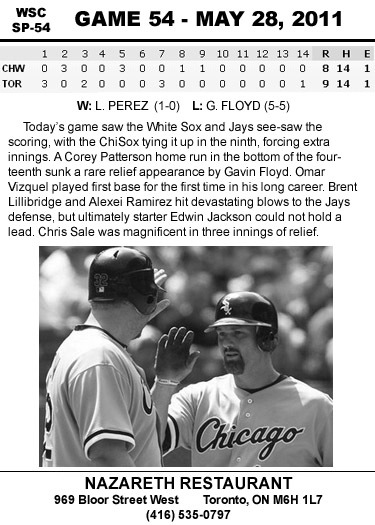 Kotsay was Ozzie's guy. Ozzie wanted him and he delivered... on the bench. 2010's "DH by committee" showed everyone what Mark Kotsay could do with regular playing time. Let's just say the results were less than spectacular. It's not entirely Mark's fault. He is an awesome bench player and spot starter, but not so awesome at the full time gig. And that's OK. 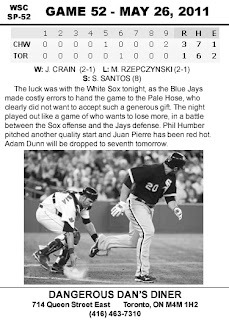 The Sox tried it Ozzie's way for most of the year and the idea underperformed. 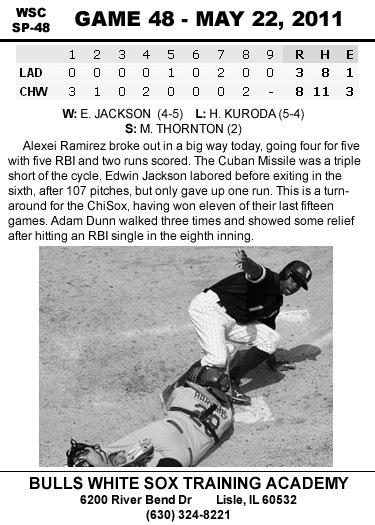 It was still better than the GM's solution of bringing in an aging DH named Manny Ramirez. Tomorrow, I'll be heading up to Milwaukee to watch the Brewers take on the Colorado Rockies. 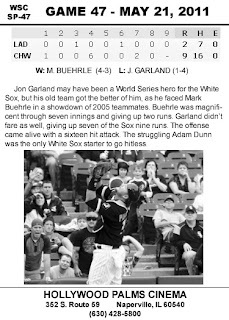 I'll see two former White Sox players somewhere on the premises for the home team. Mark Kotsay will either be in the field or on the bench. Dale Sveum will be coaching. 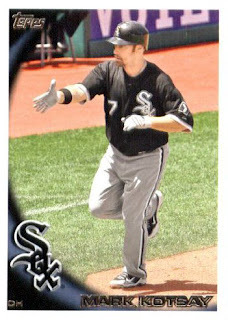 There are no cards of Dale in a White Sox uniform, but luckily for this post, there are cards of Mark Kotsay. 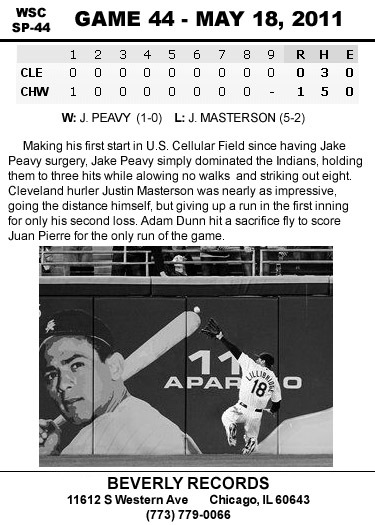 Whether or not the Brewers win is not important for the experience. I just want to see a good game in an unfamiliar place. If the loonies are correct, at least my last moments will be watching baseball with my fiancee. 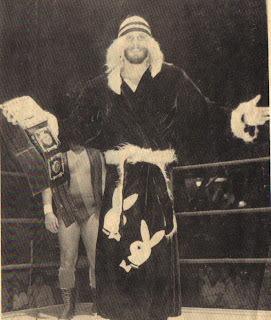 Former White Sox Spring Training invitee and pro wrestling superstar Randy "Macho Man" Savage died after having a heart attack while driving his Jeep Wrangler, in Tampa Bay, Florida. Randy's vehicle leapt over a concrete median, veered into traffic and smashed into a tree head on. Randy died from his injuries. 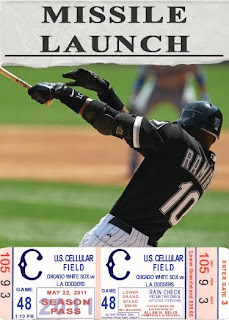 Not only did Randy have a White Sox connection, but he helped shape pop culture when I was growing up. He will be missed. 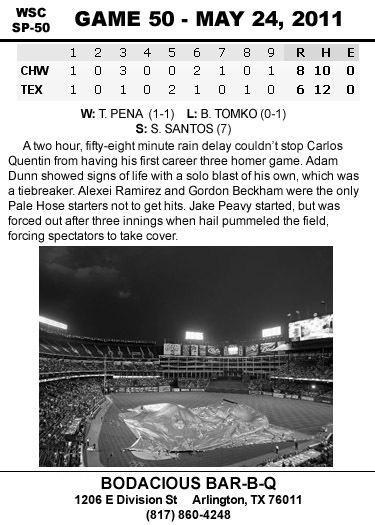 On September 10, 2004, Dallas made his MLB debut with the Angels against the White Sox, scoring his first run. 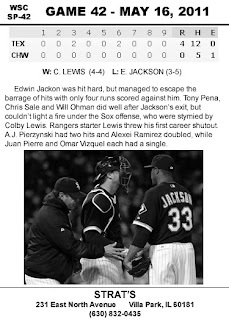 Coming full circle, McPherson made his ChiSox debut on May 17, 2011. 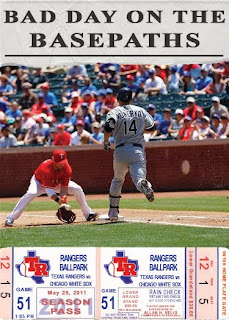 In between, he has bounced around the majors and minors, plagued by injury and bad luck. 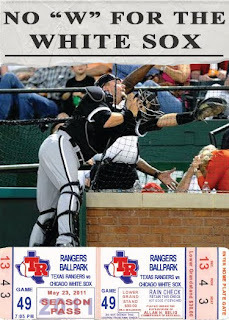 Dallas signed with the White Sox as a free agent in November 2010. During 2011 Spring Training, he had impressed the Sox coaching staff so much that he was one of the last cut. 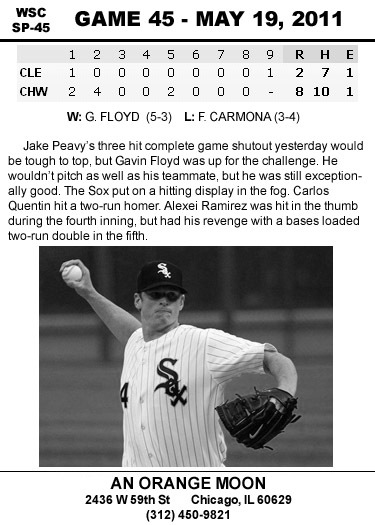 In many ways his Chicago debut was like his MLB debut, both were pinch appearances where something positive happened. In his Angels debut, he pinch ran and scored a run. 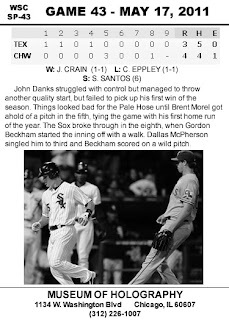 In McPherson's debut on the South Side, he pinch hit and singled up the middle, moving Gordon Beckham to third, setting up the winning run. It was Dallas' first hit in the majors since September 10, 2008. It's always a special treat when I get a package from Johngy. Usually, whatever is dropped off is full of wonders and pesky cards that have eluded my keen detection skills. 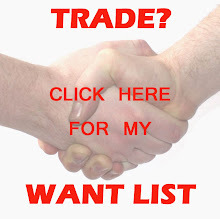 Most are from my want list, which is always appreciated, and those cards are more often than not ones that either escape my clutches or ones that I haven't been able to see a decent price available. In most cases, the latter is true. Most sellers see cards before 1981 and automatically inflate the price. The farther back you go, the worse this practice gets. I find it difficult to find cards before 1977 at a decent price, cards before 1970 are more difficult, cards before 1961 are next to impossible, and cards before 1950... forget it. Every once in awhile, I get lucky with a find, but mostly, other collectors, fans and readers have found it in their hearts to be generous. While my finances are in a state of flux, these people have stepped up and allowed me not to invoke the sanity clause in my collecting contract. "You can't a fool me, there ain't no sanity clause." Well, there's no collecting contract either, but my collecting goals do bring me some assemblance of peace during uncertain times. That's good enough for me. Usually, Johngy, or an associate of his, drops off a box or a bag off on my front porch, waiting for accidental discovery. This time, since he hasn't been around my area, he sent an envelope through the mail. Let's see what arrived. Thanks, John! Thanks to you, I can finally put that pesky 1992 Studio set to rest and I can put serious dents in some other sets. I am finally just three cards away from completing the 1969 Topps team set. You are awesome, as always! What More Could Possibly Happen This Season?